Not exactly ideal. I couldn't find a solution, so I was forced to do reinstall. Instead of using my pre-SP1 disc, I created a slipstream DVD. Despite RT Se7en Lite giving me an error at the end of the burning process, Windows installed fine... for the most part. See, the default window size is too wide. Whereas windows typically default at something closer to 4:3, mine are closer to 16:9. It's a minor issue, sure, but I'm worried it's a symptom of a bigger problem. Thinking something got goofed up during the install, I found and applied a registry edit that resets window properties. After relogging, the issue still persisted. Does SP1 use wider windows by default or is there something else going on? 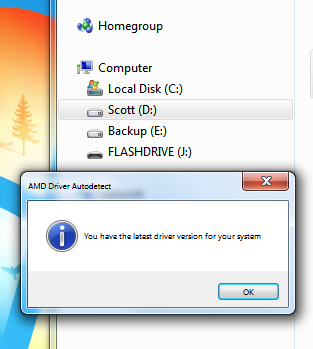 Or you could try updating your Graphic Drivers. Redo the install with the original Windows 7 disc. The RT Windows 7 Lite disc sounds like it had a problem. Start Menu, default window size and sidebar got bigger! How to change default window size ?